Lucy Kalian’s solo show Witnesses opens today! Kalian’s graphite drawings of large and small woodland objects are now on view in the Upper Gallery and the Back Bay Room. The show’s title refers to majestic forms that act as ‘witnesses’ to the ever-changing ecosystem, as well as those who wander the woods to observe its beauty. Commenting on the work in her solo show Witnesses, Lucy Kalian says, “I hope my work makes others stop, look, and think. 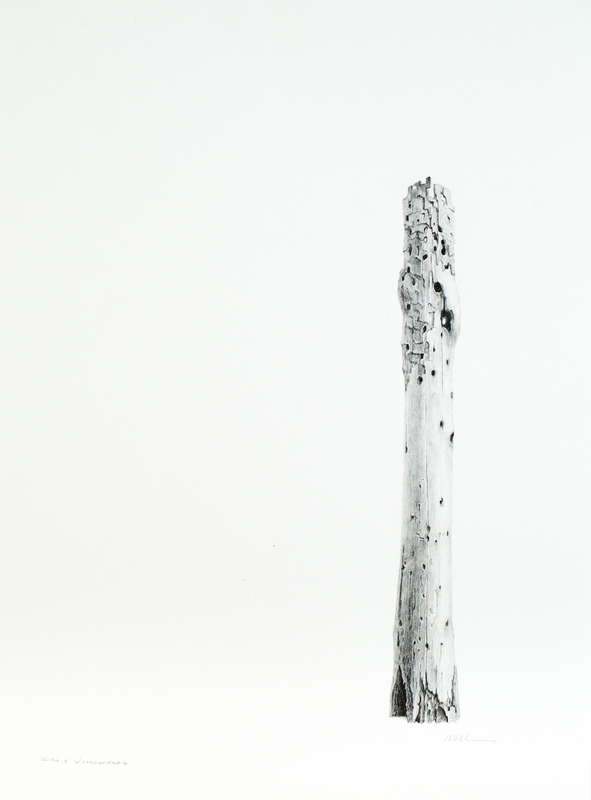 [The woodlands] are witnesses of a changing ecosystem and changing ‘humansystem.’” With trees, pinecones, stumps, and acorns standing alone against a white background, Kalian’s graphite drawings are striking observations on how humans impact the natural world. But rather than depicting bleak images of changing ecosystems, Kalian’s drawings are a testament to nature’s strength and majesty. Each drawing, large or small, is a glorification of natural figures and their ever-lasting perseverance. With captivating titles including “Party Girl” for a pinecone and “Solitary Entwinement” for a tall tree, each drawing in Witnesses captures the personalities and quirks of its subject. For example, “Fascinator” shows an acorn topped with a cap similar to the fascinator hats often seen at British royal weddings, and “Sovereign” portrays a tree stump standing tall and proud. Lucy Kalian’s Witnesses is a charming and insightful take on the strengths and personalities of woodland subjects. Witnesses is now on view in the Upper Gallery and the Back Bay Room through June 17th.